This was our first cruise on the Norwegian Getaway. We had sailed on the Escape before. The Getaway is so much like the Escape. My husband prefers the smaller ships because of fewer people and no need for reservations for entertainment or dining, but I like both sizes. This cruise we had a mini-suite which we loved. Our steward was exceptional. Very friendly. But of course, all the crew members are so friendly and go out of their way to make your visit wonderful. For me, the cruise and not the ports so much are the most important part of the vacation. You are waited on and pampered, no cooking or cleaning, everything is done for you, you just have fun and relax. Our ports were a lot of fun too. We loved Roatan the most. We went snorkeling from Tabyana Beach. Terrific time. Costa Maya, we visited a Mayan Ruins, Mayan Chocolate Factory. So much fun at every port. My ONLY complaint has nothing to do with the cruise line or ports, but with other passengers that don&apos;t comply with the rules of smoking. I would be trying to relax on my larger deck when another passenger would be smoking on theirs and all the smoke smell would come my way. I really hate that smell and I think it is inconsiderate of these people to smoke and make others put up with it. I try my best to steer clear of the outside smoking bar or casino area. Other than that, we had a great time. This was our first cruise on the Norwegian Getaway. We had sailed on the Escape before. The Getaway is so much like the Escape. My husband prefers the smaller ships because of fewer people and no need for reservations for entertainment or dining, but I like both sizes. This cruise we had a mini-suite which we loved. Our steward was exceptional. Very friendly. But of course, all the crew members are so friendly and go out of their way to make your visit wonderful. 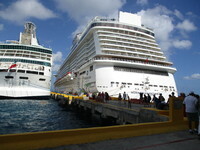 For me, the cruise and not the ports so much are the most important part of the vacation. You are waited on and pampered, no cooking or cleaning, everything is done for you, you just have fun and relax. Our ports were a lot of fun too. We loved Roatan the most. 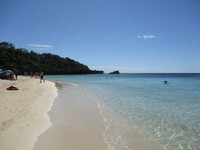 We went snorkeling from Tabyana Beach. Terrific time. 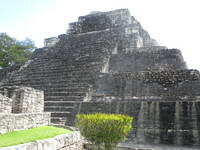 Costa Maya, we visited a Mayan Ruins, Mayan Chocolate Factory. So much fun at every port. My ONLY complaint has nothing to do with the cruise line or ports, but with other passengers that don&apos;t comply with the rules of smoking. I would be trying to relax on my larger deck when another passenger would be smoking on theirs and all the smoke smell would come my way. I really hate that smell and I think it is inconsiderate of these people to smoke and make others put up with it. I try my best to steer clear of the outside smoking bar or casino area. Other than that, we had a great time. First time in a mini-suite. We usually cruise in a balcony suite. We loved the extra space of the mini-suite. The bigger bathroom was great. It had a great layout. My husband and I could both walk in. Also, we loved the larger balcony. 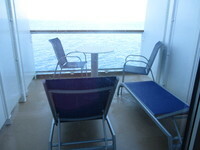 I spent so much more time on the balcony because of the lounge chairs. We toured the Belize Spice Farm and found it to be very interesting. We learned a lot about how many spices and coffee and cocoa is grown and harvested. Tabyana Beach resort was great. Our guide was very informative and helpful. Nice guy. We had a delicious lunch which was provided with our excursion. Air Conditioned bus ride to and from the resort. All the locals we met were so nice.